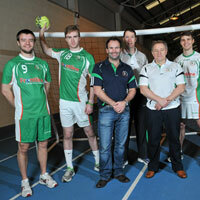 Ireland Handball enters first ever European Qualifiers on weekend 8-10 June in Tel Aviv, Israel. The Irish Olympic Handball Association has annouced its squad for the upcoming European Championship Qualification Round 1 in Tel Aviv, Israel from the 8th to the 10th of June. The team coached by Barcelona stalwart, Toni Gerona, will take on Romania, Israel and Belgium in their first ever appearance at this level. This marks an historic step for the team and the Irish Olympic Handball Association have seen increases in grass roots playing numbers this season. The enormity of the challenge is not lost on High Performance Advisor, Eddie O’Sullivan: “This is the first step in a long journey to success for the team and we understand the enormity of facing professional teams from Europe’s top tier of handball. We have a dedicated group of amateur players who will give their best and learn from this experience. This season has been all about putting the right structures in around the team to allow them to give their best performance”. Speaking at the announcement, General Manager, Lúcás Ó’Ceallacháin: “This is a truly historic step for the men’s national team and the challenge facing them cannot be overestimated. We are proud to be taking our place in the top competitions of European handball and excited about the journey we are embarking on”.